Now in its sixteenth season, the Strictly Seattle Summer Dance Intensive presented its showcase this past weekend, July 26 and 27, 2013, to an absolutely packed Broadway Performance Hall. 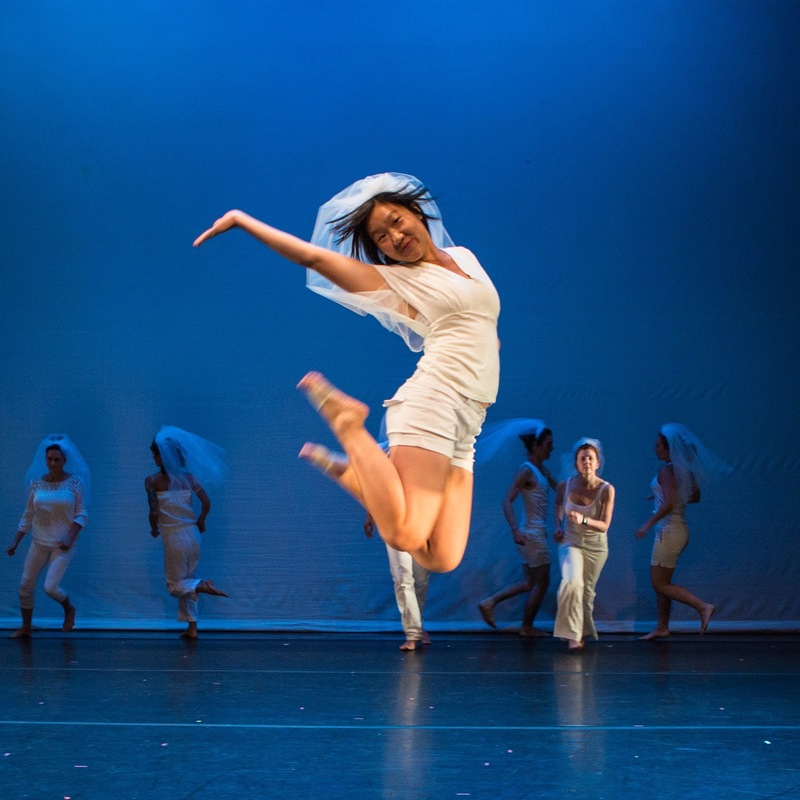 Run by Velocity Dance Center, the intensive is a three-week learning incubator for dancers of all experience levels, ranging from professionals to first timers, and the quality of show accomplished in such a short time is truly inspirational. Perhaps inspired by her then pending nuptials, Ricki Mason offered up a delightful poke at bridal culture, with each of her twenty dancers (men and women alike) clad in white with veils and bouquet. Drawing from synchronized swimming formations, iconic wedding motifs, and Beyoncé music videos, Mason laced There is no “I” in Bride with plenty of well-timed comedic details. Her excellent use of space and effective unison showcased her enormous cast. KT Niehoff also worked with a large cast, resetting her 2007 piece for five dancers on fifteen women. Tipping Point began with the dancers sitting in tight formation, legs spread in front of them, coolly focused. What commenced was a demonstration of Niehoff’s mastery of structure and design. Dancers moved in repetitive, intricately designed, and ever-changing patterns playing with sharp unison. As the bodies continually shifted, the light struck the dancers’ blue leotards in ways reminiscent of a darting school of fish. A mere ten performers banged out Marlo Martin’s latest work, Missing Pieces. It began with a tortured solo by Kaitlyn Dye against the back wall with a Greek chorus-type assembly moving in counterpoint. The dancers broke into fluid duets and trios, and brief moments of intimacy (as well as Martin’s first recorded use of smiling! ), and the piece always seemed tinged with the sinister quality of the opening image. Just when the piece was reaching its emotional peak, the mood shifted completely to a hard-hitting, action-movie-esque group section. While kinesthetically engrossing, Martin’s work felt utterly disconnected. Perhaps this transition point is where the “missing pieces” would have come in. Isolated Folds, by Ellie Sandstrom, and eight, by zoe | juniper, seemed to have identity issues. Who were these dancers and why were they doing this movement? Thumping beats in both lent a driving emotionality that seemed unsupported in the choreography. eight had the potential to be a study of rhythm and patterns, but the dancers didn’t quite have the exactitude required to pull off such a feat, and the Urban Outfitters aesthetics of the costumes—bright underwear and random t-shirts—seemed to be telling another story entirely. Aesthetically, Mark Haim got it right in his dance, …In Pieces. Dramatic lighting by Amiya Brown and vintage-feel costumes by Corrie Befort created a perfect environment in which to showcase the choreography. 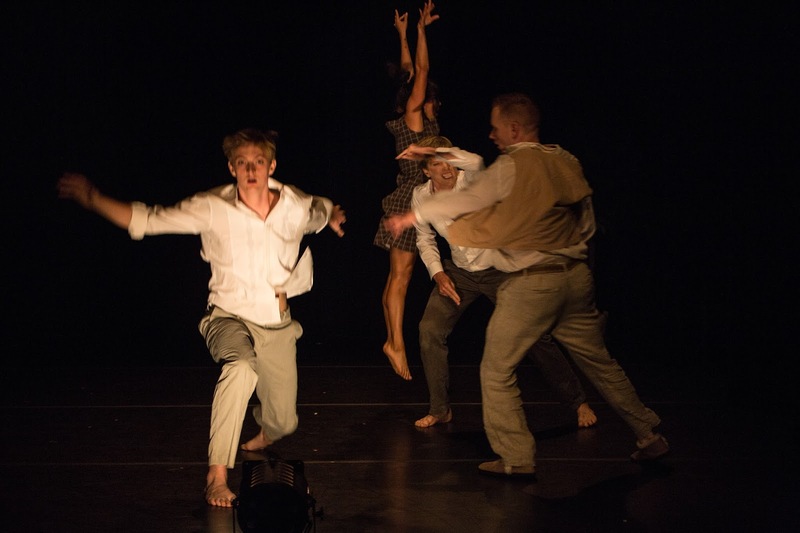 Each dancer seemed to be on an individual journey—each dancer’s movement unique and gestural, each telling a story. Haim mimicked this in the soundscore, which included violent audio snippets from Who’s Afraid of Virginia Wolf (edited by Paul Moore). The lighting would at times completely divide the stage, leaving half in darkness, or it would cast huge, ominous shadows on the back wall. All the elements presented an intentionally disjointed quality that left the audience at once intrigued and unsettled. The Strictly Seattle Performance is among the most fun dance events of the year, and the community comes out to support it in full force. The performance has become notorious for enthusiastic audiences in a city of mostly polite crowds—the abundant cheers at Saturday night’s performance lived up to that reputation—and the dancers and choreographers deserved it.